This drill focuses on footwork for defense. By incorporating a "race" into the drill it forces players to move their feet faster than they would normally. It is just something about a little competition that increases the urgency. To set up the drill place a couple of cones as shown in the diagram and have the coach at center ice with all the pucks. Split the players into two teams and have each team form a line on each side of the center ice circle. On the whistle the first player in each line skates forward to the blue line. They must get their feet into the offensive zone other wise they are disqualified. Then they pivot backward skate backward to the cone and then pivot forward around the cone and back up to the blue line (again, they must get their feet fully inside the offensive zone). The players pivot backwards again and skate as fast as they can to the second cone at center ice. 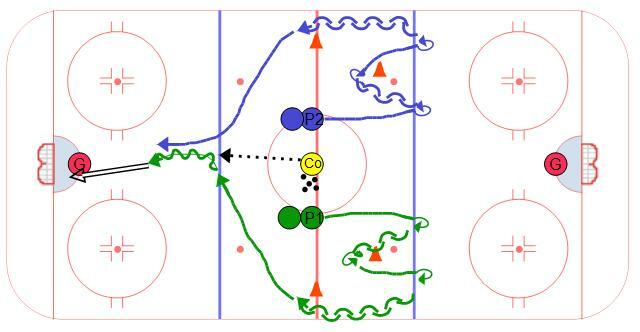 At the cone they open up to a forward skate and race to the puck placed near the blue line by the coach. Players should try to open up without crossing over. The proper technique is to open up with one leg and drive off of the other leg.